Update June.2018: If you are a non-EU resident, there are not many easy for opening a bank account online without travelling to Germany. But, there are still options open for foreigners and EU residents. Are you a non-resident and want to open a bank account in Germany? Over the years it has become difficult to open a German bank account for non-residents. DKB bank was one of the few banks which allowed opening the bank account from abroad, but in recent months and due to a high number of depositors trying to open a bank account in Germany after the Euro-crisis, they seem to have made it difficult for non-German-speaking countries. This article is for non-residents those who do currently not live in Germany. If you are an expat or foreigner is living in Germany, check out the list of best bank accounts in Germany. Why open a German bank account for non-residents? PostIdent: Verify your documents at the German post office, where the clerk checks your identity. Travel to Germany is necessary. VideoIdent: Verifying your identity by a Video call using identification service used by the bank. But this option is only possible for certain nationality depending on your passport has all the necessary information for VideoIdent. Notary: Use a foreign bank or a lawyer in your home country to verify your identity. In this case no need to travel to Germany, but there are chances that the bank does not recogonise the document are high. Credit history is the tricky part. Germany uses SCHUFA, a credit agency, for checking your credit score and history. However, SCHUFA only has their credit history if you live in Germany, have ever lived in Germany in the past or had a bank account in Germany. Therefore, if you are non-resident who is neither a German citizen nor ever lived in Germany, it will be difficult to open a bank account. This article provides some solutions which might be possible to open a German bank account for nonresidents. Some banks have allowed non-residents to open a bank account in Germany depending on their nationality or residence status to neighbouring countries. For ease, a non-resident has been categorised into four different categories below. DKB bank is open to residents of German speaking countries of Austria or Switzerland. Please check the link relating to DKB bank. N26 (formerly Number 26), a modern bank account a free bank account to residents of Austria. There are no direct online options to now open a bank account without travelling to Germany. If you know of any, you can update them on the comments here. Below are some options to open a bank account, which requires travel to Germany. A girokonto (current bank account) provides more flexibility to the customer and allows for normal use as a bank account. In case you have a house and receive rental income in Germany or other deposits, or you have to make or receive payments in Euros from clients, you will need a Girokonto. Receive and make payments in Euros. This is particularly useful if you have a rental property in Germany or clients from whom you receive payments. Can use cash machines and withdraw money in Germany. This is useful if you regularly travel to Germany for holidays or work. Possibility of refusal to open a bank account since banks sometimes perform credit check. Important: For reducing the risk of refusal, if you have an option do not apply for a credit card or overdraft facility along with your bank account application. When you apply for these facilities, the banks will have to check for your credit score, thereby increasing the chances for refusal. You can always apply for a credit card after few months of use of the account, preferably 6 months. This is because, since you already have the account, the bank will more likely accept your credit card request after looking into your bank details. Note again, not all banks will allow opening an account . In a preliminary check, we found the below banks which allows you to complete the online application by entering an address outside Germany. So in theory, it is possible that you can open a girokonto with this bank. Update July. 2018: Residents of Austria, Ireland, France, Spain, Italy, the Netherlands, Belgium, Portugal, Finland, Luxembourg, Slovenia, Estonia, Greece and Slovakia can now open the Number 26 bank account. Number26 bank will soon open applications also for residents of other countries. You can register for an invite for opening the bank account as soon as it becomes available for residents in your country. Since the opening of the bank account has a waiting list, it is recommended to register at the earliest. The registration is free, the bank account is free, so why not register now for a Number26 bank account. When applying online from the website, it was possible to enter an address outside Germany. For example below we used Greece to check if the website accepted out input. Not only did it verify that the input was correct (green tick), it also allowed us to proceed further and complete the application form and finally giving us an application number and completed form in PDF format. Check here for a detailed step by step instruction for opening a bank account with Postbank. Unfortunately, it is only possible to use PostIdent to verify the identity, therefore requires travel to Germany. Check here for more details about Postbank. Similar to when applying for a tagesgeldkonto, when applying for the girokonto on their website,the users gets a notice informing them to download a form and fill it up in case of nonresidents. Click on the link for non-residents application forms (Für Personen, die nicht länger als 180 Tage in Deutschland leben). From the form, select “Girokonto”. A pop-up list appears as shown below. From the list, select the appropriate form (single or joint account), download it and fill it up. Once you fill it up, similar to opening a tagesgeldkonto, you can approach a Notary in your country who will then check the information in your form and your identity and sign them to verify it. Not required to travel to Germany: Verification of identity is possible using a Notary in your home country. He would check your identity and the forms and sign on the completed application form. Please note however that the since the form is in German, it is possible that the Notary may have issues. In such case, you can still use the PostIdent method. Possibility of refusal: Since the bank account comes with a Credit card and overdraft, it is possible that it might be automatically refused if there is no credit history. The second strategy is to open a tagesgeldkonto (Day savings account) instead of a normal bank account (Girokonto). Disadvantages: Unlike a normal bank account (Girokonto), the tagesgeldkonto is a savings account, therefore, it cannot be used for making or receiving payments from different accounts. It also does not provide cards for withdrawal from a cash machine. You can only deposit to the saving account and withdraw from it to your personal bank account. This is a perfect solution in case you need to park your money in Germany. Though the interest rate is not very high, it still earns higher than the normal savings account. Advantages: The advantage of such an account is that some banks allow you to open a tagesgeldkonto even if you do not have a credit history in Germany. Since tagesgelkonto is a saving account without any overdraft facility, the credit rating is not strictly checked. This will overcome the problem of needing to have a credit score in Germany. This is a perfect solution in case you just need to park your money in Germany. Note again, not all banks will allow opening an account. In a preliminary check, we found the below banks which allow you to complete the online application by entering an address outside Germany. So in theory, it is possible that you can open a tagesgeldkonto with this bank. However, opening a bank account depends on the bank. So, there is a high chance that the application could be rejected based on the banks internal regulation. Not technically a German bank, but this French online bank that is well known for the excellent service and tagesgeldkonto account with the German customers. When applying online from the website, it was possible to enter an address outside Germany (see below). Unlike other applications, the wording of the application clearly stated entering an address as Tax Residence. This implies that it was possible to be a Tax resident of another country other than Germany and still open an account in Germany. In our example below we used Greece to check if the website accepted out input. Not only did it verify that the input was correct (green tick), it also allowed us to proceed further and complete the application form and finally giving us an application number and completed form in PDF format. Withdrawal to another account: FAQ of the Website informs you can enter a bank account where you want to withdraw. Therefore, it is also possible to withdraw to another bank account than the one you deposited from. This is useful in case your primary bank account is closed or has been blocked for use. Travel to Germany required: For verifying the identity of the person, it unfortunately only allows PostIdent. Therefore, you will have to be physically come to Germany and go to a German Post office with your passport and the forms to complete the application. This however can be done during a holiday trip to Germany and you do not have to live in Germany. One of the best online banks in Germany, Comdirect Bank is the Internet bank subsidiary of Commerzbank. When applying on their website, if you entered a country other than Germany, Austria or Switzerland, the users gets a notice informing them to download a form and fill it up (see below). Click on the link for non-residents application forms (Für Personen, die nicht länger als 180 Tage in Deutschland leben). From the form, select “Tagesgeld PLUS”. A pop-up list appears as shown below. From the list, select the appropriate form (single or joint account), download it and fill it up. Once you fill it up, you can approach a Notary in your country who will then check the information in your form and your identity and sign them to verify it. Not required to travel to Germany: Verification of identity is possible using a Notary in your home country. He would check your identity and the forms and sign on the completed application form. Please note however that the since the form is in German, it is possible that the Notary may have issues. In such a case, you can still use the PostIdent method. Though it is difficult and not lot of options are available, it is still possible to open a German bank account by a nonresident. If you are traveling to Germany in the near future, then it might be a good idea option to try all the above possibilities. Another possible strategy could be to first open a tagesgeldkonto, wait for a few months (say 6 months) then try to open a girokonto after that. This way it makes it possible start a credit history with the bank and possible to open a bank account in the future. Finally as a disclaimer, please be warned that they might not work for everyone. This article is only for information to help those who look to open a German bank account, the website accepts no liability and the information might change. So please try it out and let me know if it worked for you. I would be happy to hear your input and update the article. Not sure about when that is implemented. However, it will still only apply to EU citizens, and not others. So there will still be a need for this as there are many who are non-EU citizen and live abroad. Where did you get the info that Number26 bank “will soon open applications also for residents of other countries”? On their website it says explicitly: “In order to open a NUMBER26 account, you must be at least 18 years old and reside in Germany or Austria.” — with no mention of the bright future for non-residents. If you looked further in this website, in particular about the number26, you would have got the source. Let me point you to the link (https://number26.de/en/support/countries-number26-available/ ). Depending on customer demand, we will expand to more European countries throughout the next year. Also, if you went to their website to register, you can see that they even allow you to register your email if you are from other countries (the flag). The email you will receive from Number26 will also say this information. Please feel free to use this free information the way you like. If you are not convinced, then continue your search for a better solution and update here if possible. Although I try to keep the information as accurate as possible and often updated, please note that this is free information. So, if you would like to point out any discrepancy or need more information, please do so in a nice way. Thank you. So lets get this clear right now if you live and work lets say in the UK and want to open a bank account in Germany you can or you cant? in one part you say you can then you say if you don’t have a credit profile then you cant? your help would be most grateful. Hi Payam, as mentioned in the post and as you can understand, the financial institution makes the final decision on whether they would like to have you as a client. The posts lists reasons (e.g., no credit history, no local address) why the financial institution may refuse to do service with you. And the post also lists possible ways you can convince them to do service with you. After all banks make their money only if they have more clients, and as long as you are able to convince them that you are not less of a liability than an asset, they will want you. As you can see, the post lists ways where you can build your credit history (i.e, by opening a deposit account). Sometimes if you can prove that you will be getting regular income into your account, like a rental income from property in Germany, it should convince them. Remember, even a newcomer in Germany does not have a credit profile, but that does not mean he cannot open an account. So, let me answer your question this way. Has someone who lives and works in UK been able to open a bank account in Germany? Yes. Do I know if everyone can? No. Thanks for sharing. I have a follow up question–what about business/commercial bank accounts of foreign companies? I am in the USA and would like a german bank to process our international european orders. Thank you for any help you can provide. Business accounts are more difficult to obtain especially for a US company because of FACTA regulations imposed on the German banks. The banks have to do a lot more paperwork, therefore would want to avoid that. However, if you are willing to pay a bit higher for the service, then the Big banks (Deutschebank, Commerzbank) must be able to help you with that, provided you convince them your company is worth taking the extra effort. If you are able to travel to Germany to verify yourself, then it might be possible. can be used at Angry – Birds – World. I would like to open an account with DKB and it doesn’t have to be a credit account.A savings account would suffice as well as i am travelling to Germany. Number 26 is not available in my country of residence yet.So what other options do i have? I have a German boyfriend who lives there, thus spending most of my time there. I would like to open a German bank account against my UK residency, until such time I move there, which I will then change addresses. Can you propose an option? I would like it to have a sofort Card if possible. Try N26… They accept all customers that have residency within the European Union. I just tried, and unfortunately not yet for UK residents – they say they’re going to hopefully later in 2018. Online application for DKB also rejected because only German speaking countries accepted that way. You mean N26 is not yet available for UK citizens? Thanks for updating. Will keep this page updated when UK is also allowed. I am a Suadi Arabia citizen and work as a staff member at Saudi University, and I want to open a current bank account in Germany, I live in Saudi Arabia. how can I open this account and what documents do I need. I will visit the bank in Germany in person. I’m Canadian and I will spent a semester in Germany (student exchange). I’m french too but non resident of European Union. I’d like to know if I would be able to open an account in Germany. I saw N26 and I’m very interested in it. Could you please send me an option? Thanks. Thank you for this wealth of information, this is really useful for me. 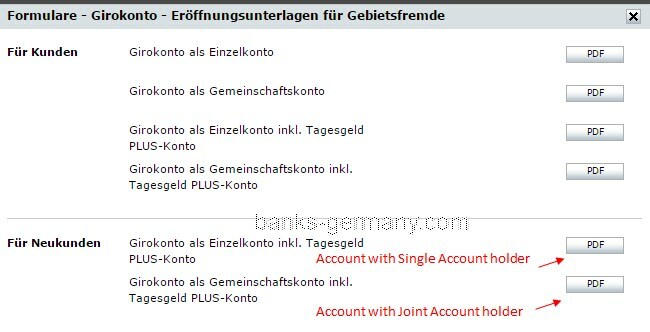 I’m looking for a bank account in Germany that includes VISA debit card (not credit). I found many banks that offer this such as DKB and Consorsbank but they require German residency. I’m from The Netherlands and I live close to the border and I also visit Berlin at least twice a year so I can visit a branch but I need a bank that accepts foreign customers and offers a VISA card. I found out that Postbank offers a VISA creditcard but do they offer a VISA debit as well? And do they accept foreign customers if you visit a branch? Or are there any other options? i am british national residing in India. I will receive rental income in Germany starting next month. Which banks have option to open Girokonto from abroad, without me coming to germany. Help appreciated ! From your article, it seems only comdirect has the option right now. Any other banks ? British national in UK. I’ve been on the N26 waiting list for some time. They emailed 2 days ago, saying coming soon, and a request to do survey questionnaire and sign up to community to be sent more info later. No email confirmation after I did this. Thanks for the update, let us know when you get one. Hello, thanks for the great summary! Do you happen to have a list of German banks that support Apple Pay? And also, which banks offer an English online banking or at least customer support in English? Maybe this is helpful for others who want to be able to use Apple Pay in Germany. I lived in Germany briefly a few years ago and opened an account at comdirect (a Girokonto and a Tagesgeld PLUS-Konto) which I have found very convenient and hassle-free over the years, even after returning to the US. But today they sent me a letter announcing, without further explanation, that they are closing my account. No idea why! Any thoughts? Btw, I recently filled out their Auslander form and IRS W-9, which they thanked me for. This follow-up unexplained closure was a nasty surprise after that cordial exchange. I suppose it was because of the FACTA requirement imposed by the US government. I also just received a letter from Comdirect canceling my accounts. I contacted them and they are unwilling to explain, saying only that they are permitted to cancel without giving the reason. Anyone aware of other viable options to hold euros and not incur fees?